The Green Party nominated Ellis Boal as its candidate for Charlevoix County District 1 Commissioner. The nomination was at a Party caucus at the Horton Bay General Store Tuesday evening. He will face Republican John Haggard in a vacancy election on February 28. Later in the evening Boal was elated to learn the anti-big-box ordinance passed by over 60% in Charlevoix Township. Boal served on the board of "This Is Our Town," the citizens group that stopped a huge Wal-Mart store from coming to Charlevoix last year. This year he continuted working for the ordinance in meetings and in the newspapers. Wal-Mart will never come back. "If elected, I will continue my activities protecting the environment and the local economy, and implementing Green values," said Boal. For starters, he intends to approach candidate Haggard and propose they agree that neither of them put up lawn signs for the election in February. "They're ugly," he said. Boal has been active in social movements since he was young. "My life turned around after spending a semester in 1964 on exchange at Morehouse," an African-American college in Atlanta. Its graduates include Martin Luther King Jr. and the filmmaker Spike Lee. Later he marched for civil rights, and an end to the war in Vietnam. He became a labor lawyer in Detroit, representing workers. In 2000 he moved to this area, near his family in Hayes Township. He maintains a part-time law practice, and edits legal rights books for union members. He writes technical code for various non-profit websites. Last year he ran as a Green for Charlevoix County prosecutor, getting 646 of 2790 ballots cast, or 23.15%, in the district. Boal has actively supported the striking nurses at Northern Michigan Hospital, and helped organize anti-war activities in Petoskey. He writes occasional guest commentaries for the Petoskey News-Review. He runs, plays and sings music, and has other hobbies. "I look forward to the campaign," said Boal. "I will meet with every county department head. I will attend commissioners' meetings and township meetings. And of course I will be going door to door to hear from the citizens." The website from last year's prosecutor campaign is now re-tooled. The online donation page still needs work. It should be ready in a few days. The name of the campaign organization is "Friends of Ellis Boal." The site notes all my reported cases, all articles and books, my websites, various personal data such as music and running records, family information, education, schedule of upcoming campaign activities, and other matters. Not to mention my positions on issues. Of most interest is the summary of the 2004 prosecutor campaign. I am sure the other candidates do not have sites up yet. When they get sites, I will link to them on my site and ask them to reciprocate. The most interesting recent development, aside from the 61% anti-big-box zoning referendum win in Charlevoix Township last week, is the switch of our local Congressman Bart Stupak to the out-of-Iraq column in the House of Representatives. This was in response to my guest commentary for the local peace group in the Petoskey News-Review on election day. Until then Stupak's website said he voted against the war in 2002, but the US can't walk away until order is restored and that won't happen without international cooperation. Now he says the US must fund the equipment to keep the troops safe and the give them promised benefits, and Bush should come up with a plan for troop withdrawal over the coming year. The position of Northern Michigan People for Peace, our local group, is to bring the troops home now not in a year. But it's still a big improvement for Stupak. Stupak is a Democrat. But his piece cited me so many times I wondered if it was a backdoor endorsement. I have never met him. I have two opponents, a Republican and an Independent. The Independent came out last week for environmentally-sensitive job creation along the lines -- she said in two newspaper articles -- of Traverse City and Grand Traverse County which have waiting lists of clean industries and companies wanting to relocate there. Charlevoix has the same potential, she said in the articles. So I called the heads of the Traverse chamber of commerce and downtown development authority, faxed the articles, and asked about waiting lists. The Chamber head said it had no waiting lists. The DDA head said it had a waiting list of merchants looking for retail space and another of space owners looking for merchants. Neither of them knew of any lists the county or city had. I emailed her my findings on Monday and have no word back. I wonder if there actually are any waiting lists. At this writing she has not yet filed signatures to get on the ballot. She needs nine by the end of the month. At a county meeting we attended last week, I offered to be a signer. In October she filed a sworn declaration to run as a Democrat. Then she withdrew it and said she would run Independent. Then the Democrats endorsed her. On the Republican side, the day after the election the Petoskey newspaper asked me to comment on the closeness of their primary, decided by just four votes. My analysis: "A couple of wizened old Republican war horses that fought to the bitter end and one was left standing." That quote convinced one person to say he was supporting me and was going to advise his Democrat friends to do the same. Later I wondered if what I said was negative campaigning. I looked up "wizened." It has a more negative meaning than I realized. I had thought it was related to "wise." But the derivations are different. I am considering apologizing to the two Republicans. My Republican opponent is still not determined, pending a recount of the November 8 primary. If exactly two votes change the result would be a tie. Connie Saltonstall, an Independent candidate, filed 22 signatures Tuesday which should be enough for ballot status. Congratulations to her. At its meeting November 14 Charlevoix Township rejected a legal challenge to the results of the 340-215 vote which approved a zoning regulation limiting big box stores in the township. Along with many others I lobbied for the ordinance, which will prevent the return of Wal-Mart. My dialog in the newspaper with Congressman Stupak about the Iraq war is now uploaded. Stupak's response urges bringing the troops home within a year. The following letter about one of my cases this summer was sent to the editor of the Petoskey News-Review, unsolicited and unexpected by my client and myself. The paper ran it November 9. The editor supplied the caption. The writer later permitted me to note it in the campaign. I have remarked on the case elsewhere on the site. After a December 5 recount, John Haggard was declared winner of the Republican primary over Josh Barnes. Congratulations to John. According to media reports, Josh has pledged to support John in the election in February, but may run against him again in the Republican primary this summer. At a bizarre meeting in November the county commissioners defeated a workplace smoking ban on a 3-3 tie vote. The regulation would cover Charlevoix and three adjacent counties. Then the commissioners voted 5-1 in favor of it, provided Charlevoix County is exempted. The law provides that the four counties must act as a group. The other three counties voted for it. The bottom line is, Charlevoix voted for the regulation in every county except itself. I would replace the commissioner who proposed this scheme if I am elected. I will support the workplace smoking ban for Charlevoix County. The full regulation is downloadable at Northwest Michigan Community Health Agency. Generally, at worksites it prohibits smoking in common areas, health care areas, and vehicles. Also covered are public transportation, public accommodations, meeting places, common areas of multi-unit residential areas, indoor galleries, libraries, museums, and recreation areas. Smoking is allowed in restaurants, bars, and private residences. Employers may set up separate ventilated inspected smoking rooms for employees, under terms negotiated by unions or employee groups. I have represented employees throughout my working life. I have seen injuries and deaths at the worksite. Sometimes the fault was the employer's, sometimes it was the employee's, and sometimes fault could not be assigned. None of that matters when it comes to saving lives. There are many workplace health-and-safety laws and this should be one of them. Smoking-related illnesses are a burden on the health system. The issue is too important to be left to personal choice. Clients and attorneys have not smoked in my office since the mid-1970s. John Haggard and I had lunch on Wednesday. It will be an interesting race. We are chairs of our respective parties, Republican and Green. John opposes the worksite smoking regulation, and opposed the ordinance in Charlevoix Township to regulate big box stores, which won by 61%. I favored both. More specifics on big box regulation. Senator Levin meets with local activists to discuss war in Iraq. 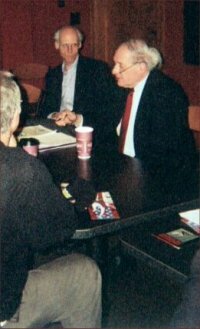 Senator Carl Levin met with delegates of the Traverse Area Peace and Justice Community as well as Charlevoix resident Ellis Boal, to discusss the Iraq war on Friday, Dec. 2 in Traverse City. Boal, who is a Charlevoix resident running for the first district Charlevoix County Commission seat in February, is also a member of the Petoskey based group, Northern Michigan People for Peace. The Traverse Area Peace and Justice Community selected Boal to be one of seven delegates in attendance at the meeting with Senator Levin. The delegates, from Grand Traverse, Leelanau, Benzie, Charlevoix, and Otsego Counties, were Steve Morse, Tim Keenan, Larry Helvie, Randy Bond, Joanna Dueweke, Simon Anton, and Boal. Also in the group were veterans, high school seniors, and peace activists. According to Boal, in discussing the group's initiative to end the war in Iraq with Senator Levin they cited a New York Times/CBS poll released in September which showed 52 percent of Americans polled support immediate withdrawal of troops, even if that means abandoning the president's goals in Iraq. Aside from immediate withdrawal the Traverse Area Peace and Justice Community delegates also urged Levin to support an end to funding of all hostile activities, a restoration of veterans' benefits, and discussed depleted uranium testing for all veterans of wars since 1991. Students at the event stressed banning military recruiters from schools. While Levin disagreed with the immediate withdrawal of troops he did tell the group he feels the U.S. administration should set a timetable for withdrawal from Iraq and said the U.S. has little credibility among the Iraqi people. 'I'm glad he took the time to meet with us,' Boal said. The group now plans to request in writing that Senator Levin attend a second large, public forum to hear the opinions of a broader group of people with varied opinions on the war in Iraq. Please email me if you would like a copy of my written remarks to Senator Levin. The most interesting development lately -- the relevance to the campaign is indirect -- is I became deeply involved in the problems at General Motors and Ford about health care and its UAW workers. It suffices to say that I spoke briefly to a group of 160 angry union members in Flint on December 11 and one thing led to another. By December 30 Charlevoix and I were on page one of the Wall Street Journal. A Bloomberg business reporter called, and later that day Charlevoix was in newspapers around the world. "It's a very, very close vote, but there aren't extensive, detailed procedures for regulation of ratification votes in the UAW," says Ellis Boal, a Charlevoix, Mich., labor lawyer who is scheduled to meet with Ford UAW members next week. [t]he protests, which represent one of the largest grassroots rebellions inside the UAW in nearly 20 years, are a potentially serious challenge to both GM and Ford, which have been attempting to offset the rising cost of health care. Why do I mention a national controversy in a campaign for a local county commissioner race? Because I am offering to take the creativity, enthusiasm, and work ethic shown in my labor work, and put it at the disposal of the county. Want to vote by absentee ballot? For registered voters it's not hard. Just request a ballot in writing from your township clerk by 2:00 pm the Saturday before the election (February 25 for the election on February 28), and return it by 8:00 pm on election day. The request must be on a form. The form is available from the clerk or online. Requests are approved for any of six reasons: (1) age 60 years old or older, (2) unable to vote without assistance at the polls, (3) expecting to be out of town on election day, (4) in jail awaiting arraignment or trial, (5) unable to attend the polls due to religious reasons, or (6) appointed to work as an election inspector in a precinct outside of your precinct of residence. There are a couple of other rules for special situations. The full rules and ballot request forms are available from the bureau of elections. Since the nomination $984.13 has come in and been deposited to Friends of Ellis Boal. Just under $1000 means I don't have to file a 2005 campaign finance report. They were from seven contributors. None are close friends, family, or myself. One, for $500, was from the Green Party of Michigan. One came in through the PayPal button on the donate page. It was all generated from personal appearances and mass emails like this one. There were no phone calls or personal emails. Campaigning on the issues makes life easy! What to do with it? One thing not to do is buy ugly lawn signs. Signs aren't effective anyway in the February snow. Besides they don't advance public discussion of the issues. They just say "vote for me." More people own computers than dishwashers, I read recently. The best way to have discussion is for the candidates to trade links on each other's websites. I am waiting to hear when the other candidate sites will be going up. Postcards and ads can work too. They are recylcable, and they have room to say something meaningful to the voters. For starters, about $200 more and there will be enough for printing and mailing a postcard to all registered district voters. There are a little over 3000. The county gave me a disk with all their addresses. I will be printing it out shortly, to carry around and ask people to check off and contact 5-10 other voters each, and spread the word. It would be nice to treble the present sum. This is about as intense a funding pitch that you will get from me. Please consider it. One of my pledges has been to meet with county, township, and community leaders during the campaign to get their views on issues. Last month I started fulfilling that. In addition to the regular meetings of public bodies, so far I have met with, or have meetings scheduled with, the health officer, planner, prosecutor, register of deeds, chamber of commerce head, and the clerk, and also my Republican opponent. The Independent opponent has declined several invitations. Meetings are listed on the schedule page. Want to hear more? Join me for coffee at the Horton Bay General Store on Sunday mornings. And vote on February 28. Candidates' forum: Friends of the Library is sponsoring a public forum with the candidates on Sunday, February 12, at 3:00 pm, at the Charlevoix Library. Questions about the event: Mona Bergeon, 547-2742. Money: $1951.77 has now come in to Friends of Ellis Boal from a total of 14 contributors. None are close friends, family, or myself. Well, except for my Mom. Two came through the PayPal button on the donate page. Contributions continue to be welcome, either through the button (PayPal takes a small percentage), or directly to: Friends of Ellis Boal, 9330 Boyne City Road, Charlevoix, MI, 49720, phone 231/547-2626. No checks from corporations or unions please. Also enclose a note stating your employer and occupation. Protect the water, natural resources and character of Charlevoix County. Protect workers' lives. Regulate smoking in common areas and worksites. Take public stands on issues of importance, and leave a paper trail. Focus on policies not personalities. Turn down the political volume and do what's right for the county. Instant runoff voting to ensure majority rule elections. Good-by to Wal-Mart. Executive board of This Is Our Town, that stopped the company in Charlevoix Township. Frequent guest opinion writer in local media, on issues of peace, labor, and county administration. Chairperson, Charlevoix County Green Party. Labor attorney, representing workers, with practice in states from Nevada to Pennsylvania, and Puerto Rico, including landmark cases in law school text books. Recently put Charlevoix on page one of Wall Street Journal. Near-centennial family roots in the district. Homework: One of my pledges has been to meet with county, township, and community leaders during the campaign to get their views on issues. On the schedule page you will see 38 meetings I have attended or will be attending, as part of the campaign between now and February 28. The number will go above 40 before this is over. Not to mention breakfast on Sunday mornings at the Horton Bay General Store. The purpose is to learn the nuts and bolts and everyday work of the county. When I meet with the various officials, I don't ask for endorsements (I do ask for their votes if they live in the district). Instead I ask what they see going on in the county and in their individual departments, and what could be done differently or better. In other words, I'm doing my homework. One thing I have promised voters is to see if there is a way to stimulate non-seasonal economic activity, to do this without increasing congestion or undercutting the area's natural beauty, and to see if county government has any role in it. A complex, intractable problem, that always begins with data collection. I will give it a shot in my next email. Door-to-door work: Is about to start. There were less than a thousand voters in the district in recent elections, so the task is not so daunting. Candidates' forum: Friends of the Library is sponsoring a public forum with the candidates on Sunday, February 12, at 3:00 pm, at the Charlevoix Library. According to the Courier of February 1, 2006, the annual budget for 2005 was $11,080,927. What are your priorities for spending for 2006? What are your specific reasons for running: are there changes you'd like to make in the way the Board does things, or things you'd like to add? Do you believe that the County needs a professional manager or resource person? What kind of disaster preparedness do you believe is necessary for our county? Are there specific updates or improvements you'd like to implement in parks, roads, facilities, equipment, etc.? What do you visualize for Charlevoix County in terms of future growth, and do you believe it should be controlled more stringently? Homework: One of my pledges has been to meet with county, township, and community leaders during the campaign to get their views on issues. On the schedule page there are now over 40 meetings I have attended or will be attending, as part of the campaign between now and February 28. Diary letters such as this one are collected on the diary page. Want to hear more? Join me for coffee at the Horton Bay General Store on Sunday mornings. And vote on February 28. Money: $2048.57 has now come in to Friends of Ellis Boal from 15 contributors. Three came through the PayPal button on the donate page. We are now in the concluding phase of this campaign. The following are overall thoughts. Charlevoix has long been Republican country. No Democrat has contended for county office since I have lived here, except Paul Richards when he ran for commissioner of this same district in 2002. And when Paul learned that Green Party candidate Bill Henne was in the race, he ended campaigning. He told supporters to vote for Bill. I don't know Paul, but I appreciated that. So the smart money is on John Haggard my Republican opponent. I hope to beat him anyway. Since Michigan does not use instant runoff voting, a plurality will suffice. I first thought of running when John Jarema, my Republian opponent in the 2004 prosecutor's race, suggested it in front of his supporters right after the election. A few weeks ago Sheriff George Lasater also told me he respected that I had run a clean campaign that year. They both said it without prompting. Later I asked them if it was ok to repeat it. Both said yes. It gives me confidence when people in the opposing party step forward and say things like that. I had issues to run on. This included my vocal and successful work, with others, in defeating Wal-Mart in Charlevoix two years ago. Even though not everyone is anti-war, I think people also admire my organizational skills in conceiving and chairing meetings for the successful anti-war rally in Petoskey last fall. My name is known from the prosecutor's race, and from several guest commentaries published in local newspapers. I debated Congressman Bart Stupak about the Iraq war in print last fall, in the course of which he moved closer to our position of bringing the troops home now. I am a person who does his homework. During the campaign I ended up attending 43 meetings with various boards, officials, and business leaders, all while keeping up a busy work schedule. I am willing to put that energy at the county's disposal. Last summer I decided definitely. I noticed the Democrats had forfeited again, and John Haggard and Josh Barnes were in a contentious Republican primary. Josh told the Charlevoix Courier last summer that John had no business running, because as local party chairman "[h]e assigns campaign funding. He holds the purse strings of the Republican party. He could benefit financially from the position he's in...." John was a gentleman and didn't respond other than to deny a conflict. Verbal assaults like Josh's are typical of the recent history of Republican politics here. They inspire one of my campaign themes: "Turn down the political volume". John won the primary, just barely, after a recount. According to the Courier on December 7 Josh is considering running again this August. Asked in November by the News-Review to comment on the closeness of the vote, I said the race was "a couple of wizened old Republican war horses that fought to the bitter end and one was left standing." Later I looked up the word "wizened" and realized it has a much more negative meaning than I intended. When we had lunch I apologized to John. It turned out he didn't know the word either. Being small, the Green Party nominates by a noticed caucus, not by a primary. I began preparations and was receiving encouragement from a number of people who backed me in the 2004 prosecutor race. Then I learned that Connie Saltonstall was gathering signatures. She had sworn out a declaration at the clerk's office to run as a write-in on the Democratic primary ballot. I know Connie only politically. In recent years she has a good record of helping build the local Democrats and going to bat for the Charlevoix library in its fight with the school board over property her family donated in the 1960s. But running as a write-in Democrat seemed odd. I wondered why they hadn't just nominated her in the usual way. I called her and asked if it was proper for her to run this way. She said yes. I called the state election bureau and told them her plan. They ruled it illegal. She was informed and withdrew her declaration. Connie and I spoke again. She said now she was going to run in February as a write-in. Later she changed her mind and ran as an Independent on the ballot. Her spokeswoman Sara Gay Dammann circulated an email November 3 saying Connie would gather signatures. The required number was 98 and a plan to get her at least double that was well underway, the email said. I investigated again, and confirmed her required number was only 9. The election bureau also said there was a maximum of 30 and if she turned in 98, or twice 98, the clerk would reject them all. I relayed this to Connie and Sara Gay. In the end, she turned in 22. She was the last candidate in the race. In November the Democrats announced they had endorsed her. I have never heard of a candidate not listing an endorsement, but her campaign literature later made no mention of it. Her main themes were jobs, the environment, and roads. She told the News-Review on November 4 that Traverse City had a waiting list of businesses wanting to relocate there and Charlevoix had the same potential. She told the Courier on November 9 that Grand Traverse County had a waiting list of clean industries hoping to relocate there and Charlevoix had the same potential. She told the candidates' forum on February 12 that the county needed a marketing plan. The waiting list proposal seemed odd. I called several government and business and bank officials in Traverse City. None of them knew anything about waiting lists. All of them wished it were true that clean industries were on a waiting list to get into Grand Traverse County. I asked Connie about the lists in a November email. She responded only in a January mailing on letterhead to her supporters. It repeated without supporting detail that Traverse City has a waiting list of businesses that want to relocate there. All of this has brought me to wonder if Connie would be competent to serve. When I tell the waiting list story to people including her supporters, no one can explain it. Most just laugh. If she is elected and Wal-Mart tries to come back, it will laugh too. People have asked why I was nice to her given that she was an oppponent. It's true I was nice. I offered to meet with her several times to discuss issues and compare notes. Three times I gave her the names and phone numbers of Lansing election bureau officials so she could check on procedures. I was the one to let her know that collecting too many signatures would involve needless work and could endanger her ballot access. I kept her from running illegally as a Democrat. The Monday after Thanksgiving I ran into her at the clerk's office, and answered questions about election procedures. I gave her a copy of her organization statement which I had in the car. She was concerned because she had filed it late. I consoled her when she said her campaign might be, as she phrased it, "dead in the water." I said she would only have to pay a fine, which turned out to be $10. I wish she had thanked me. Anyway my answer to why I helped her is I assumed that when she and her supporters evaluated her performance they would realize she is not up to the job. I thought she would leave the race. Even if she didn't, we live in a small community and there will be life after the election. It's better to be constructive. A year ago even John Haggard called me with a labor law issue. I don't represent employers against unions. I gave him five free minutes anyway. Later my prediction proved incorrect. Connie built an impressive list of supporters. They don't mind the laughs. Her pre-election statement reports she collected $4215 from 27 supporters, of which $1800 was from her trust. John too has become active. His statement reports he collected $3065 from 34 supporters, of which $1000 was from him and Phyllis Haggard. At first he ran only on his name and history, with his ads, lawn signs, car signs, and bumper stickers simply saying to vote for him. In the last few weeks he finally put out a leaflet. It turns out his program is the same as Connie's and mine: jobs and the environment and roads. Plus according to his literature and the Courier of February 15, he has "political connections" in Lansing. He is not campaigning on his opposition to the anti-big-box ordinance in Charlevoix Township, which I supported. Nor is he campaigning on his opposition to the smoking regulation ordinance, which both Connie and I support. But, it is good that he put out anything at all. Instead of a discussion of personalities a vigorous race developed about issues. The Courier put all our campaigns on page 1 this week. The process has elevated political discourse, and I feel my campaign stimulated that. Though she handled it poorly herself, I do give Connie credit for being the first to raise the dilemma of jobs and the environment. John also raised it and pointed to his work in advocating for the mothballed Big Rock nuclear plant to become a state park. For myself I have given it a lot of thought. I'm a Green, and I have worked professionally for working people on employment problems all my life. So you would think I had a ready answer. I didn't. I went and met with people at the Northern Lakes Economic Alliance who work on marketing the county. I ended up writing a serious paper, which is on the economic development page. I won't repeat it all here, but my bottom line is: I don't see much that the county should be doing about unemployment more than it already is; the best we can do is keep our eyes and ears open for possibilities and keep out the bad ones. Not very hopeful, but that's how I see it. My money report: The pre-election statement shows $2103.73 collected from 17 supporters, of which $30 was from me. Why only $30? I gave at the office, I suppose. My campaign has been the most energetic, witness the website which I do myself, my attendance at 43 meetings, and postcards to everyone who voted in the district in 2004. Plus I went in the hole for $1527.72 in the prosecutor race. A word more about one issue that gained traction in the last weeks of the campaign. At a county commissioners' meeting Wednesday road commission issues were on the agenda. In the course of that the problems of the Boyne City Road were brought up, which is where Connie and I both live. Someone said it was the most dangerous road in the county. Someone else noted that my father Stewart was killed on it a few years ago. (At age 92 on a stormy winter day he was on his way to work. Unaccountably he started fishtailing. No alcohol was in his system.) Federal and state money will come available to repair the road in a few years. In the meantime there is no short-term solution except to put up signs warning motorists. What surprises me about the issue is how contentious it is. Road rage is not limited to drivers at the wheel, I am seeing. There is out-of-area money also available for a non-motorized bike path along the road. But it is separate money not related to the money for fixing the roadbed. Possibly it can come earlier than the roadbed money. Yet anger about the road is such that it would be "political suicide," in the view of road commission manager Pat Harmon who personally favors the path, to proceed with the bike path first. Citizens will just not believe that the two moneys are de-linked. I conclude this essay with my letter to the editor printed in the Charlevoix Courier and Petoskey News-Review this week. Because it is about him, I faxed a copy to John before it ran, so he would have a chance to respond in print before the election if he wanted. (He didn't.) No rule of political ethics requires this, but it's how I work. The Charlevoix Courier reported last week "Haggard said due to his political connections it would be a benefit to voters to vote for him." This referred to Republican John Haggard's remarks at a candidates' forum sponsored by the Friends of the Library on February 12, for the Charlevoix County commission election next week in district 1. Though not mentioned in the Courier piece, at the forum John specified the "political connection" as Richard DeVos, if DeVos is elected governor. The specific benefit he mentioned was accelerated state money for needed repair of the Boyne City Road. John Haggard has a distinguished record of public service to the county. And I take him at his word that he has interested fellow Republican DeVos in the Boyne City Road, and more generally in the problems of Charlevoix County. But I am troubled that repairs to a road would be decided by political connections, and to hear John say this is the way life ought to be. If DeVos is elected it would be because of support from key Republicans in many counties. He will owe favors to all. Perhaps he will owe other counties more if they outhustle Charlevoix Republicans in garnering votes. Who's to say we will be the winner? Then again, DeVos might not win. Where would the county be then? I am the Green candidate for the same commission seat. The election is this Tuesday. Who are my own political connections? The Green Party doesn't have any. We believe the next governor should allocate funding according to the counties' needs, not their politics. Contributions continue to be welcome, either through the button on the donate page (PayPal takes a small percentage), or directly to: Friends of Ellis Boal, 9330 Boyne City Road, Charlevoix, MI, 49720, phone 231/547-2626. No checks from corporations or unions please. Also please enclose a note stating your employer and occupation. Executive board of This Is Our Town, that stopped Wal-Mart in Charlevoix Township. Accountable government. This website will stay up during my term to state the reasons for my votes on major issues at the county commission. Frequent guest opinion writer in local media, on issues of county administration, labor relations, peace, and the Middle East. Recently put Charlevoix on page one of the Wall Street Journal. Finally, a word on the "waiting list" issue I have mentioned several times in these e-blasts. At my regular Sunday morning breakfast at the Horton Bay General Store, my Independent opponent Connie Saltonstall was there with supporter Chris Campbell. Connie is on this email list. She remarked that my last email had wrongly attributed to her the assertion that the Traverse area has a waiting list of "clean industries" wanting to move there. Connie said she had always used the term "businesses." I produced a copy of the Charlevoix Courier of November 9 about her endorsement at a meeting of about 40 Charlevoix Democrats. A passage says of the meeting: "She pointed out that Grand Traverse County has a waiting list of clean industries hoping to relocate there and said, 'We have the same potential.'" Connie said that was a misquote, and I should check the facts. She and the witnesses at the meeting had not asked the Courier for a correction. Nevertheless I emailed the Courier, with a copy to Connie, asking if the paper was sure about the quote. This morning editor Julie Witthoeft wrote back saying the story was a press release from the Democrats after the meeting. Julie said the Courier is comfortable with the content, and if I had further questions I should contact Bill Lovett, the source of the article and head of the Charlevoix Democrats. This morning I forwarded Julie's email to Connie and to Bill. I have heard nothing back. As to the existence of the waiting list, Connie said she actually meant to reference a waiting list of retailers and office businesses wanting to move to downtown Traverse City, not a waiting list of industries wanting to move to Grand Traverse County. It's true and I have reported there is such a list for downtown Traverse City. But it's just a sign-up list, not an ordered waiting list as for a table in a restaurant. Downtown Traverse City also has a list of available property looking for tenants. It has been on the links page for a month. If the above numbers hold, Connie won by a 49% plurality. There were 675 voters, which is 17.5% of the total of 3858 registered voters. For comparison, the total voters in the November Republican primary between Josh Barnes and John Haggard was 776. We will know the numbers more exactly by tomorrow morning, but the final result might be that Connie won an absolute majority. The result is a surprise to me. I thought John would win, and that I would do better. I congratulate Connie and wish her the best of luck. It was an interesting campaign, and an issues-oriented campaign, something that Charlevoix has not experienced in recent years. My candidacy contributed to the quality of the political discussion, as did the candidates' forum sponsored by the Friends of the Library. My vote total was well under 10%, compared to the 18% I gained in running for prosecutor in 2004 against a Republican. I can't think of any mistakes I made. Certainly I worked hard. When I was considering this run, seasoned political advisors said I would do better to run as an Independent not a Green. The results today seem to vindicate that advice. But I couldn't turn my back on the Green Party. It has values which speak for me and which I hope to instill in the community. The electorate is not prepared for them yet. We have always known our task is monumental. The only thing to do is to persevere. Some day our time will come. In the next few weeks I will write a more complete summary. There were no write-ins. Of 3858 registered voters 17.5% voted, 101 fewer than in the Republican primary in November. A low turnout was expected due to the election being in winter and no other choices being on the ballot. Connie won outright with percentages ranging from 53% to 58% in the three districts not including Charlevoix Township, where John won with 56%. My percentages ranged from 4% to 7%. My only comfort is in having denied Connie a majority. Interestingly, this last point illustrates one of my campaign positions, the traditional Green Party plank of instant runoff voting ("IRV"). With IRV, voters would have designated a second choice on the ballot. Computers can automatically re-evaluate results with the lowest vote-getter's votes reassigned to each voter's second choice. A majority winner is then determined. IRV can also work recursively, when there are four or more candidates. Connie won only by a plurality. More then likely under IRV, most of my voters would have designated her as their second choice. She could have accurately said, as the Charlevoix Courier reported, that "she was surprised to have captured the majority of votes." In fact, everyone was surprised. Everyone thought John would win. In the last six years with one exception only Republicans have campaigned actively for county office. The exception was JoAnne Beemon, who was elected in 2000 as a Green drain commissioner. But no candidate opposed her on the ballot. Only one person predicted Connie's win. The week before the election Roger Knutson, the naturalist columnist for the Courier, wrote a piece headed, "Election theory: Candidate with the biggest signs wins." Connie had the biggest signs. The Courier waited to the day after the election to run the piece. It concluded: "Voters are not consciously choosing the largest yard signs, but it is difficult to find any evidence in recent national elections that they are choosing on the basis of substance rather than appearance." My analysis is below and I invite comments. First, some updates of the last days of the campaign. Everybody knows that one-on-one door-to-door campaigning is the most effective. One supposes this would be especially true in a small election in a small district like this. Fred Gray of the News-Review told me Connie said she hadn't done any door-to-door work. I'm not sure if John did any either, or if he did much campaigning period. But I had decided if I was going to go down it wasn't going to be for lack of trying. I didn't go to 48 meetings for nothing. I am used to being outside. I run or ski 40 miles a week. Door-to-door work as the days lengthened at the end of February was what I planned. But it happened the last three days were bitterly cold. Donning felt-lined boots and vaulting snowbanks, being met most of the time with an empty house, removing my mitts in the wind to fold a card and leave it in the door -- none of that seemed like it would be fun. The campaign was ending. As a runner you learn to lean at the tape. I summoned my resolve and chose neighborhhods with close houses. First I re-alphabetized my voter lists by street name, to skip the ones who don't vote. Also skipped were unplowed houses, and houses with a sign for an opponent. But chill got to me and I didn't stay out long. Only 45 minutes or an hour each day. I tried to make up for it by going to two last meetings on election eve. One was a tour of the new Charlevoix library, still under construction. "Haggard Plumbing" trucks were parked outside. It's actually going to be a very impressive structure. We will have lots of community meetings there. Help on the last day came from Lou Novak and Priscilla Dziubek, Green Party activists from Detroit, who took a half-day from a skiing vacation and hit 100 houses with cards. Other one-to-one help was a series of calls by Greg Justis in Petoskey, with whom I had tried one of the nurses' strike sit-in cases a couple of years ago. JoAnne and Rick Beemon also called 30 likely voters for me. Was any of this effective? The numbers were impossibly low. It doesn't seem so. Connie's supporters put three letters in the Courier the week before the election. One said she was for the smoking ordinance, would be a fresh voice, and would work with a marketing plan to bring jobs. The second said she was a fresh new face, her father served the community for many years as a doctor, and she is the most capable nominee. The third said she was an excellent visionary school board member 30 years ago, and a proven well-qualified candidate. In other words she was unqualifiedly terrific and readers should vote for her. My own letter in the same issue didn't say to vote for me. I thought it better to show how I approached an issue, and let people think for themselves. The letter critiqued John's stated appeal for votes based on county politics rather than county needs. I received many compliments on it, but few votes. Connie's pre-election financial report showed that of 26 financial contributors, 22 were women. None of her campaign issues were women's issues and I wonder how she did this. Very impressive. In the Republican primary in November 51% of voters were women. A disk of the February election isn't available yet to see if her efforts attracted a higher percent of women to vote this time. The honor roll: Matthew Abel, Eugene Babinski, Susan Boal, Tim Boyko, Lorna Foster, Craig Harvey, Greg Justis, Nick Karras, Murray Kilgour, Barbara MacArthur, John Marler, Ken Mathenia, Lynn Meadows, Allen Nielsen, Felix Novak, Lillian Novak, Allen Nielsen, Will Provine, Peter Schermerhorn, John Speier, Wendy Thompson, Glen Van Lehn, Jeffrey Vogel, Jim West. There were 24 in all, and all but one gave without being asked. Unsolicited, the Green Party of Michigan also put in $500. Of the 24, seven paid $475 via the PayPal button. From that, PayPal took $15.88 for fees. It also made a setup donation of $ .45. PayPal was an aggravation to set up, but once functioning it worked nicely. I got an email each time someone donated, and then transferred the money, less the PayPal fee, electronically to the bank. Expenses summed to $2299.58, for printing, stamps for a mailing to likely voters, ads in two newspapers, bank charges, and copying. I will hold the balance of $ 292.30 for now. If I don't run in November it goes back to the Green Party. Eight people came to the Charlevoix County Green Party Nominating Caucus at the Horton Bay General Store on November 8: JoAnne Beemon, Ellis Boal, Susan Boal, Stephen Brede, Barbara Danly, Bob Hamil, Bill Henne (chair), Ruth Paterson. There was extended discussion whether to nominate anyone at all, given that Connie had indicated she would be running. But after a couple of false starts it was not clear she was going to follow through. She hadn't filed anything yet though I had given her procedural help. Republicans were the only ones with their hats in the ring. This was the deciding factor. All in attendance supported my nomination. Char Sanderson took care of mailing the notices for the Horton Bay caucus. As in 2004 Murray Kilgour and Tim Boyko continued giving me nut-and-bolts advice. Much less was necessary this time. Tim was the one to suggest visiting with county department heads, contacting the Traverse City Chamber of Commerce about the waiting-list issue, and hanging out at the Horton Bay General Store. Stephen Brede, Ruth Paterson, and Rick and JoAnne Beemon helped with affixing stamps and labels to my card mailing. Lou Awodey at Connections North in Boyne City labored at my formatting and printing as in 2004. Bob Hamil helped configure the PayPal button on the donate page. Though not a volunteer, I want to acknowledge the Friends of the Library for sponsoring the candidate forum on February 12. Candidates were give written questions in advance. I don't know who wrote them, but I found them very much on point, bringing me to consider issues I otherwise would not have. Returning the favor, I wrote out my answers and posted them on the candidates' forum page, so voters not at the forum could read them later. Readers of these emails may recall my postings ## 8 and 9 of February 24 and 27 reviewed the progress of the campaign to date. These mentioned my breakfast of February 26 at the Horton Bay General Store. I had been going there Sunday mornings hoping to encounter voters, and posted it as a campaign spot on the schedule page. A regular after-church crowd meets there. I had come to enjoy them, though I am not religious. There was one aspect of the February 26 breakfast I did not report. I didn't want to personalize an ongoing campaign. As mentioned in the previous postings, Connie and Chris Campbell came in and sat by me. She turned and for the first time addressed the subject of waiting lists, of which I had spoken several times in the campaign. She receives and reads these emails. She disputed something I had been quoting her as saying. The question was whether it was "clean industries" or "businesses" that she had said at a Charlevoix Democrats meeting were on a waiting list to get into Grand Traverse County. To me it seems like a minor point. Anyway she said "I never used the expression 'clean industries.'" I showed her the press release from a three-month-old Charlevoix Courier quoting her using that exact phrase. She looked at it for a minute. Then she said it was wrong. Asked the source of the error, she didn't know. Asked why she hadn't corrected it at the time, she said she didn't need to. All this I reported before. What I did not report was the vehemence of her anger and that of Chris. "You're an attorney and you should know to check the facts," they insisted. I answered the information was reported in a reliable newspaper. Further I had emailed Connie in November asking for details, and questioning whether the Traverse-area waiting lists really existed. They said she had no obligation to respond to an email, and I should have called. In the middle of all this Connie thanked me sarcastically for one of the times I had helped her out with procedure. In the heat of astonishment, I don't remember which one it was. Finally we resumed our breakfasts, and they left. I have never been treated so rudely in a public place. The backroom breakfast area is a small space. The Sunday-morning regulars had heard it. They commented at some length. I started to explain, and then thought better. I said it was settled. Chris came back to leave a tip, and I offered him my hand. He came back a second time. We chatted amiably about a mutual friend. Connie did not come back. Really though, the matter was not settled. I made her veracity an issue only after she inserted waiting lists into the campaign and would not answer a direct question in my email. She had said I should check the facts again, so I did. Back home I emailed the Courier to ask if it stood by the November story. Editor Julie Witthoeft answered yes, saying its source was Bill Lovett, the head of the Charlevoix Democrats. I forwarded this to Bill and Connie and later called Bill. He said the release, which ran unsigned, had been written by Sara Gay Dammann and himself without clearing the quote with Connie ahead of time. Indeed, Bill said it did quote her incorrectly. She had actually said "businesses" not "clean industries" were on a waiting list to relocate to Grand Traverse County. He added Connie had seen the piece after it appeared in the Courier in November. No correction was ever made. Describing the marketing plan she hopes to create, in three Courier articles in February she used the phrase "clean businesses," not "clean industries" and not "businesses." At any rate we can score this one for Connie. She had a right to be angry in public for an incorrect quote, even on a trivial detail. But she should have directed it at Bill and Sara Gay and the Democrats, not me. This could have been clarified without anger. Four times early in the campaign I suggested we meet to discuss issues. She did not have the time. I am sure she has excellent qualities for which voters supported her. Courtesy is not one of them. There is one other important point about the Sunday conversation in Horton Bay. Validly, Connie had noted in various campaign articles that Charlevoix County businesses like the Big Rock nuclear plant, Hoskins Manufacturing, the Coast Guard Cutter Acacia, Lexalite, and Harbor Industries had shut down or downsized. The result was the loss of 1200 county jobs in the last five years, according to the Democrats' press release. Connie repeated the figures at the candidates' forum. I don't know the breakdown but assume they are accurate. Her solution to the job loss was to point to Grand Traverse County's waiting list of businesses wanting to relocate there, and say that Charlevoix County had the same potential. At the breakfast she said for the first time she had proof there was a business waiting list in Traverse City. There were minutes of a meeting of the Charlevoix City Downtown Development Authority which mention it, and I could get the facts from Charlevoix DDA member Jeff Porter, she said. The next day I called Jeff. He confirmed there was mention of such a list at a Charlevoix DDA meeting. Indeed, I later found an April 2005 News-Review article, "Downtowns Turn Up The Charm," saying the same thing. I have now posted the article on the "links" page of my site. Additionally the Traverse City DDA had told me of a sign-up list in November. I had made note of it in emails and on the economic development page. But whether it is a waiting list or just a sign-up list, all the sources say the list belongs to the Traverse City DDA, not Grand Traverse County. The two are very different. The county, like Charlevoix County, is over 400 square miles. Traverse City is only 8 square miles. The DDA covers only a small fraction of Traverse City. According to its website, the downtown has 4000 employees, a zoo, museum, opera house, and theatre, and "is home to the area's finest women's clothing, jewelry, and home accessory stores." The same page says downtown also has continuing office vacancies. They are listed with contact information. Renters are free to strike a deal and move in with no wait. Connie and I were competing for a county position not a DDA position. Charlevoix County is largely rural. It is over 100 times the size of Traverse City's downtown. Abandoned county industrial sites have no potential for development similar to Traverse City's downtown, with fine clothing, jewelry, and home stores, and nearby upscale cultural attractions. Everyone knows that. But more than any other, in an issues-oriented campaign, this potential was Connie's message. And it won for her. I am baffled. My professional life is given to dealing with problems of the working class. With 1200 lost jobs in a county of 26,000, a candidate must be careful and sensitive in pointing the way forward, if there even is a way forward. She wasn't. After the election she outlined her marketing plan for the News-Review. She will "creat[e] a coalition of interested organizations and governments in the county which are already working on these issue, and coordinate the efforts." The Northern Lakes Economic Alliance ("NLEA"), supported by Charlevoix and two adjacent counties, has been doing exactly that with a paid staff since 1984. After the election I told Andy Hayes, who heads NLEA, of her quote. He will be contacting her to let her know. What are my own thoughts on economic development? Before the campaign I had not given it much thought. It was Connie's comments which got me thinking about it. I give her credit for that. After considerable head-scratching I came up with a white paper and put it on the "economic development" page on the the site. The sum of it: We dwell in a paradise, but local stores and factories are leaving. Wal-Mart couldn't have fixed the problem. Waiting lists are a fiction. NLEA approaches the problem methodically but with only incremental success. My usual approach to problems is to mobilize citizen action, as we did in stopping the big boxes. But government has a role to play too. The piece concludes saying we don't have an encouraging prognosis. All people can do is stay alert to possibilities, provide expertise, and keep out the bad ones. My critique of John's program, while as trenchant as my critique of Connie's, was more concise. What was nice about John was, however much you disagree with him you know where he stands. He said to vote for him because of his political connections to legislators and a potential Republican governor. I sent letters to the editors in the last week noting and criticizing that. I copied them to John so he would have a chance to respond in print before the election. He didn't. Too late to help, a week after the election Republican State Rep Kevin Elsenheimer did announce support for a proposal of John's, to convert the Boyne City Road into a state road in order to accelerate funding for needed repairs. Perhaps my letters had an effect in defeating John. But what was very curious for me was that the Wal-Mart fight had no coattails. John had opposed us on that, voting against the big-box ordinance as a member of the Charlevoix Township Planning Commission. Township voters rejected his position by 61% last November. I was a leader of the Wal-Mart fight. Connie played no role in it. Yet Charlevoix Township was the one district in which John beat Connie. And though I had done door-to-door work there, my percent (4.7%) was lower than elsewhere overall. Connie: Protect natural resources, coordination of township and city governments, balanced growth, develop a marketing plan and emulate the Traverse area's system of waiting lists, improvements to roads, health care for children and seniors, expansion of recycling, facilitation of affordable housing, conversion of the Big Rock nuclear site to a public park, support for the workplace smoking ban, and a county budget manager. She grew up here, and taught elementary school and served on the board of eduction here in the 70s. She co-owned and managed a national media research firm for 18 years, and now she thinks of herself as a professional volunteer. She used lawn signs, a mailing, and ads, and no website. John: Upgrade the Boyne City Road, conversion of Big Rock to a state park, sell the county's beauty and recreation to tourists, work to meet the needs of seniors, utilize vacant industrial sites, opposition to the workplace smoking ban, his political connections in Lansing, and no county manager or director. He was born and grew up here, has co-owned the family plumbing company for 35 years, and belongs to several professional and service organizations. He used lawn signs and ads, and no website. Ellis: Protect the natural resources and character of the county, a thoughtful but not hopeful analysis of the county's economic problems, came out first for regulation of workplace smoking, take public stands and leaving a paper trail, an end to personality-driven politics, IRV, end political blight and lawn signs, my activities in fighting big boxes, protecting Native American rights, and getting our local congressman to think again about the Iraq war, my reputation in scholarly legal works and the national media, accuracy in campaigning, action on the county's needs not its politics, and near-centennial family roots in the district. I reserved the county manager/director issue to further study. I did not use lawn signs, but had ads, a mailing, these emails, and a website. The emails go to a fluctuating list; 423 people are still with me. Most are outside the county, but I made diligent efforts to find as many in-county addresses as I could. I tried particularly for community leaders, though I am sure I missed many. What were the issues that distinguished us from one another? Lawn signs, workplace smoking, Wal-Mart and big boxes, political connections, waiting lists, a county manager, tourist or non-tourist oriented economic development. A word more about the lawn sign issue, because some say I am wrong about it. Like other billboards they blight the environment. Part of the function of a campaign is to elevate public discourse. But what signs say in the most succinct way is "It's all about me." By contrast, ads, postcards, websites, and forums by contrast can impart a political message. Still, lawn signs are an American tradition. Courts have ruled it would be a free-speech restraint to pass an ordinance forbidding them. That doesn't mean candidates can't agree mutually to forego them, which is what I asked the others to do at the outset. In Hawaii in 2000, 41 candidates statewide pledged not to use lawn signs. Why wouldn't any candidate prefer to run on issues, and save expense and some trees in the bargain? Lacking agreement, perhaps if I had relented and put them up I would have won. But I wouldn't have felt right about it. People have asked what my plans are politically. Before the election two very smart people recommended that I run as an Independent. I did not. I am enough of a Leninist to believe in party politics. I am involved in social action for the long haul. The county and the country need radical social change if life is to improve significantly for working people. My opinion is that can only happen through the auspices of a party. A party is a group of people sharing a vision working together in a disciplined manner. At the same time a party can run clean government, deliver immediate services, and continue contributing even if voted out. Unaffiliated individuals, no matter how competent and inspired, acting alone cannot accomplish significant change. Finally, a party keeps you honest. It has a program of stated policies. Members and non-members can review it to know what to expect from candidates. The Green Party's is at http://migreens.org/GPMI-platform050906.pdf. Locally, our most prominent Green Party activists, JoAnne Beemon and myself, are known and respected. As elected drain commissioner at the time, JoAnne played an important role in stopping Wal-Mart. Outside of politics I have the same view: I did/do the Wal-Mart work, antiwar work, and Teamster nurse support work all as part of groups. Most people do not agree with working through a party. Though he emphasized his Republican ties at the library forum and I re-emphasized them in letters to the editor, John's signs and ads did not identify him as a Republican. Though Connie is an active Democrat and the Democrats endorsed her, her signs, ads, and literature likewise said nothing of it. She underlined this in the News-Review after her win: "I had support as a candidate, not as a party representative." I have never voted Democrat or Republican, and have never represented an employer. For me, these are of a piece. The Green Party of course is flawed. It is inexperienced, not all that disciplined, and may not survive. But it has a soul and it's where I plant my flag. The results have brought me to think my smart friends in the beginnng may have been right, and the county won't accept even the most qualified Green. Because it was a vacancy election the term ends this year. There will be another election in the fall. Both Connie and John have campaign money left over, and so do I. After his Republican primary loss in December Josh Barnes told the papers he was considering running again, and in the meantime would work to get John elected. But the day after the election he took another swipe. He told the News-Review: "I was delighted to see her win, because I don't think a Republican chair [John] had any business whatsoever in entering that race and challenging what I believe would have been a safe seat." I showed myself as a candidate who was organized, thoughtful, determined, and generous. But voters showed these are not the qualities they prefer. Six percent is pretty disappointing, and it wouldn't be right to ask supporters to put another $2500 down a black hole. If Connie makes as many mistakes as a commissioner as she did as a candidate, voters might change their minds. Whether that would happen by November is chancy. Meanwhile the bank account can sit. The website and the PayPal button will stay up. I will just wait and watch. A word about other activities I am involved in, mentioned during the campaign. My part-time law practice continues. This fall after seven years and a trip to the court of appeals I got a UPS worker, who was fired for union activity, back to work with seniority. We are still litigating backpay. I have a postal worker in a similar position, and a few other smaller cases going. I sing bass, and occasionally now play bass, with the Charlevoix Men's Chorus. Rehearsal is my favorite hour of the week. Interestingly, with one newly forming exception none of these men is a friend. But we make lovely music together. I continue my monthly website work for Labor Notes, putting up news articles and scripting pages for an upcoming conference in May in Dearborn. We hope to have 900 attend. The site has a monthly feature of streaming music of the labor movement. The April song I am particularly pleased with, a Marc Blitzstein tune recorded onto a scratchy vinyl 78 by the composer in 1938, lost for many years but recently rediscovered. The lament of a prostitute down on her luck, it was the kernel for Blitzstein's famed agitprop show The Cradle Will Rock, premiered in New York from the audience by actors defying Actors Equity which banned them from appearing on stage. The story of the production was memorialized in Tim Robbins' 1999 movie of almost the same name, Cradle Will Rock. Blitzstein's heirs gave me permission to use the song. To hear it go to Labor Notes --> "music" and click on the title. In November I had a guest commentary in the News-Review critiquing our Congressman Bart Stupak's then-current stay-until-order-is-restored position on Iraq. The following week he responded, saying for the first time in print that the troops should come home by the end of 2006. In December I was one of a delegation that met with Senator Carl Levin, head of the armed services committee, urging him to bring the troops home. The Courier interviewed me and reported on it. Three weeks after the election our local peace group had another rally in Petoskey with music and workshops. I led one of them. The project I have been spending the most time on -- equal I would say to the political campaign -- is the upheaval in the auto industry about shrinking companies and shrinking benefits for UAW members. This and the political consequences in the union are what the December WSJ article was about. My particular interest is retirees. Health-care benefits are supposedly vested for life, 30-year members are told when they go out the front door. Yet GM and Ford, with UAW agreement, announced reductions last fall. Together over six years they will result in reduced care totalling $20 billion, affecting several hundred thousand retirees and their families. The UAW always promised it would never do this. Negotiations for the deals were done contrary to the democratic up-from-the-ranks procedures the union has in its constitution, or so our appeal says. During the campaign I drove to Flint and Detroit several times, and then after the election to a federal court hearing in the class action which challenges the deal. My object is to steer this into a union appeals hearing which has power to stop the deal. The UAW has an elaborate appeal procedure. I am quite familiar with it. At this writing the judge just approved the GM deal, but a union hearing is this week and still could turn the union around on the question. A separate hearing later will deal with the Ford retirees, who are particularly controversial. In a nationwide rank-and-file vote the Ford deal passed by only a few tenths of a percent. The vote in a Cleveland Ford plant is under challenge. It was in a week the plant was down. If that one is rerun it could make the difference and defeat the deal nationally. The Green Party of Michigan has scheduled its quarterly meeting for May 20-21 at the Dilworth Hotel in Boyne City. All are invited. Finally, I brag about my mother, Susie Boal, who lives next door. The other day, just returned from a winter sojourn in the south seas with her sweetie Herb, she was invited by friends to play bridge. She is three months short of her 90th birthday. I play rarely and not well. But I know enough to be impressed by this, though she only bid game: She made slam in clubs. As mentioned I am mystified by the outcome. But I decided the proper thing was to honor Connie by attending her first meeting as a commissioner. Curiously, none of her supporters were there. Originally I planned to say nothing. But during public comment I said this: "I am here to congratulate my opponent Connie Saltonstall for her win in the recent election." As she thanked me the room broke into applause. Later in the meeting, as promised, she re-introduced the workplace smoking regulation ordinance. It looks like it is on its way. Connie: Total contributions including in-kind: $5464.31. No fund-raisers or voter meetings were reported where refreshments were served. Total expenses including in-kind: $4141.68. Of the expenses, $513.88 (12%) was for food and beverages at a victory party, and $740.67 (18%) were for signs. The remainder of $2887.13 went to issues campaigning. Connie's top contributor was herself. She gave $417.53, and her trust fund lent an additional $1800. The campaign ended up with a balance of $1297.23, or $0 if it pays back the loan. Of her total 28 contributors, 23 were women. Her final report shows a minor addition error. John: Total contributions including in-kind: $4740.00. Of this $1875 came in at a fund-raiser at Giuseppi's, which cost $487.17. Total expenses including in-kind: $3751.41. Of the expenses, $1529.08 (41%) was for food and beverages including election night. The remainder of $2222.33 went to campaigning. His signs were purchased before or during the Republican primary; his reports from then do not distinguish types of advertising. His top contributors were himself and his wife Phyllis. Together they gave $900. John also loaned $500. He also gave $1457.86 in the primary. Together in the two races counting the loan John and Phyllis put in $2857.86. The campaign started with $450 left over from the primary and ended up with $1438.59, or $938.59 if the loan is repaid. Ellis: Total contributions including in-kind: $2621.43. No fund-raiser or voter meeting where anything was served. Total expenses including in-kind: $2329.58. All expenses were for issues, and none was for food, beverages, parties, or signs. The Michigan Green Party was my top contributor at $500. There were no loans. The campaign ended up with $292.30. In sum, as to funds for issues campaigning, the three of us spent about the same, with Connie first and myself in the middle. In food and beverages John way outdid Connie. Connie was tops in contributions.